Your signature scent says a lot about you. I know from personal experience I tend to change what scents I use based on the season, or what I'm doing for the day. If I'm staying in I use something totally different than if I'm planning an evening out with my hubby. Your choice of scent can even tell a person what sort of mood you're in. I know if I'm not in a super upbeat mood I'm not as likely to choose a scent that's floral or sweet smelling. Funny how sometimes we do things like this though and never really give it a second thought. I bet if you looked right now you'd find multiple scents of body wash in your shower. I know off the top of my head I can think of three different ones I have in mine. To me choosing my body wash is all about the mood I'm in. If I'm just going through the motions I tend to use my "everyday" body wash. But if I'm in a good upbeat mood and about to head out say shopping I'll grab a stronger scented body wash. It's kind of like food, when you walk in the kitchen for a snack it's all about what mood you're in as to what you'll choose. Yes I know I just compared body wash to food, but that's the best comparison I could come up with! 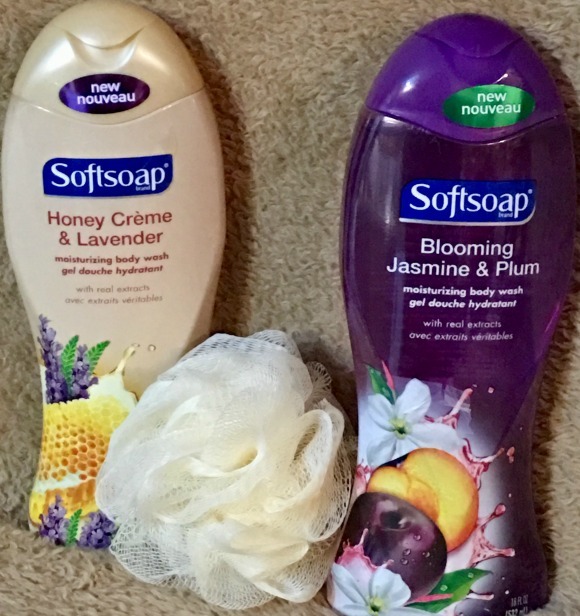 Softsoap knows we all have our own preferences when it comes to body wash and that's why they keep coming out with new fragrance combinations to help meet everyone's signature scent needs. The latest scents are Honey Crème & Lavender and Blooming Jasmine & Plum. I tried each of them for about a week straight using nothing else but the one body was each week. I have to say I did notice the scent difference when I switched. Maybe because I was paying more attention I'm not really sure. Of the two though I would say I liked the Honey Crème & Lavender more. Which to be honest shocked me because I'm not a big fan of lavender scented stuff. I'm not a big floral person when it comes to scents, but this combination really smelled delightful. So much so I'm about to run out of it because I've picked it so many times now when showering. So tell me what do you think? Which new signature scent most intrigues you and makes you want to try it? Win it: One lucky reader will win a set of Honey Crème & Lavender and Blooming Jasmine & Plum body wash. This giveaway will end March 3rd at 11:59 PM EST. The winner will have 24 hours to respond to my email. If no response, a new winner will be chosen. Prize fulfillment will be made by the sponsor, I am not responsible for prize delivery or lost or stolen deliveries. Open to residents of the US. a Rafflecopter giveaway Disclosure: I received compensation in the form of product from Colgate-Palmolive in exchange for my honest and unbiased thoughts. All thoughts and opinions stated are my own and are in no way influenced by my partnership with mentioned brands. I want to try the Honey Crème and Lavender scent. The Blooming Jasmine and Plum moisturizing body wash calls my name. I love the smell of Jasmine & this one sounds awesome. Honey creme and lavender is the one I want to try. I love the smell of lavender. And honey is a great skin softener. I want to try the Honey Crème & Lavender . Both scents sound nice. I'd like to try the Honey Crème & Lavender scent first. I would like to try the Honey Crème & Lavender -- sounds like it would smell wonderful. I would love to try the Honey Crème and Lavender. Blooming Jasmine & Plum body wash sounds wonderful to me! Honey Creme and Lavender because I love lavender and all the benefits it can provide. Definitely the Jasmine & Plum scent! I would most like to try the honey creme and lavender scent. I think Honey Creme and Lavender would be my choice. Both sound interesting! I think I want to try Blooming Jasmine & Plum first! We would love to try the blooming jasmine and plum. My girls love to use Softsoap! I can't wait to try the Blooming Jasmine & Plum body wash. It sounds wonderful! I can't wait to try the Blooming Jasmine & Plum body wash. I bet it smells wonderful. They both sound wonderful but I would probably pick the honey creme & lavender. i would love honey creme and lavender. I would choose the honey vreme and lavender scent. I'd like to try the Pomegranate Mango infusion. Blooming Jasmine & Plum body wash sounds good. I am curious about what that combo smells like. I want to try the Blooming Jasmine and Plum because I like fruity scents. Honey creme and lavender sounds amazing!!!! The jasmine and plum sounds interesting. I'm not sure what that would smell like. The blooming jasmine and plum sounds good to me! I am most excited to try the Blooming Jasmine and Plum scent! the Blooming Jasmine & Plum sounds like it would smell good. I'd like to try honey cream and lavender! Sounds great. I'd like to try the Blooming Jasmine and Plum. I hope to win! I would like to try Acai Berry & Tropical Water Moisturizing Body Wash. I would love to smell either sent on my wife! I would like to try the honey creme & lavender, the name makes it sound so yummy smelling. The Blooming Jasmine & Plum sounds awesome. I would like to try the Honey Creme & Lavender. I think the Blooming Jasmine & Plum sounds wonderful. I'd love to give it a try. Lavender is one of my favorite scents so I'd like to try the Honey Crème & Lavender. I really want to try Blooming Jasmine & Plum . They both sound nice, but the Honey Crème & Lavender sounds like something I would really like. thanks for the chance to win the set! I'd pick the Blooming Jasmine and Plum. My favorite would be the Honey Crème & Lavender. I love the honey scent. Blooming Jasmine & Plum would be our first choice! It sounds amazing. My daughter wants to try it also. I am most excited to try the Honey Crème & Lavender because I love the smell of lavender!